Gap-fill exercise in which students must write the past simple form of the verb indicated. Page 2 can be distributed for students to check their own answers. The worksheet can be used for all levels for pronunciation practice of the three endings of regular verbs in the past simple. This printable, downloadable handout is meant for high school students and adults at Elementary (A1) and Pre-intermediate (A2) level. 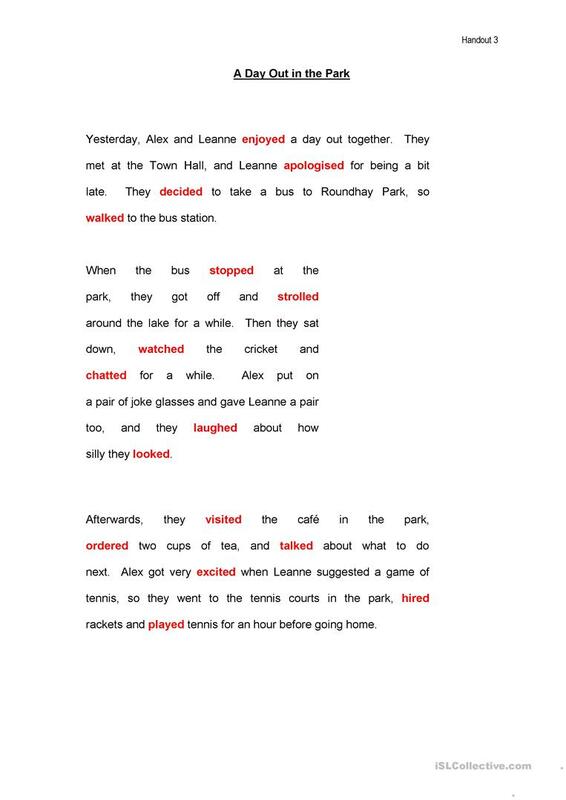 It is aimed at revising Past simple tense in English, and is excellent for enhancing your students' Reading and Writing skills. vas8402 is from/lives in United Kingdom and has been a member of iSLCollective since 2013-03-03 20:25:56. vas8402 last logged in on 2018-10-10 17:41:31, and has shared 1 resources on iSLCollective so far.